Where could you stand and have one foot in Hudson and one in Nashua? Many folks remember walking along the sidewalk of the concrete bridge (north side of the bridge); halfway across we would see this pink granite marker commemorating the building of the bridge and identifying the principals from Nashua and Hudson who served on a joint committee to oversee the construction of the bridge in 1910. Turning to face the plaque one could easily stand so as to have one foot in each municipality! 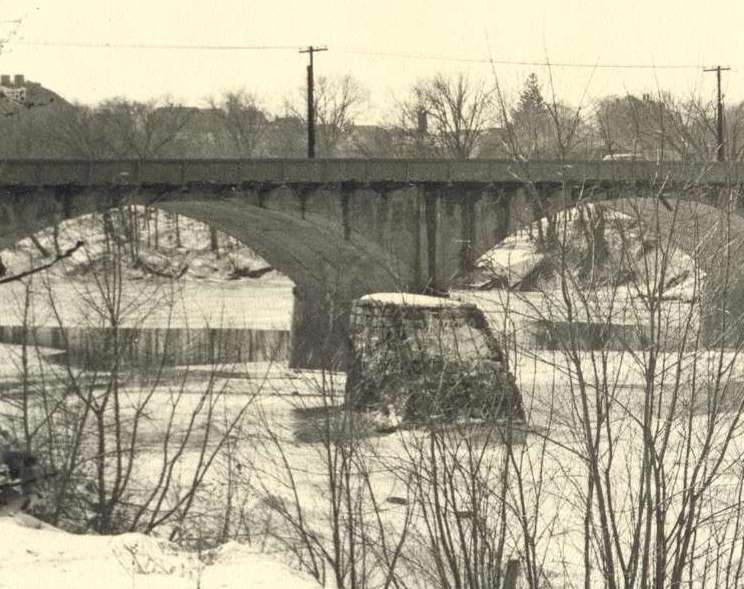 Prior to 1910 the bridge between Nashua and Hudson was an iron bridge built in 1882. At that time there were no electric cars (trolleys) crossing between the two villages. In 1895 the bridge was strengthened in order to allow electric cars in addition to horse drawn vehicles to use this bridge. By 1909 safety of the bridge became an issue; especially in regard to the weight of the trolleys which was now twice the weight previously planned for. The bridge was deemed unsafe by two different engineers. An article in the 1910 town warrant to replace the iron bridge with a new steel bridge was indefinitely postponed. The recently elected Board of Selectmen, Jesse S. Wesson, George N. Dooley, and Guy A. Hopkins were authorized to confer with managers of the street railway and representatives from Nashua to decide what should be done. By May 1910 the plans were revised to build a bridge of reinforced concrete, consisting of 5 arches with 4 piers in the river and abutments at each end. A special town meeting was called and this plan was voted on: 194 votes cast with 192 in favor!! The three recently elected selectmen along with Kimball Webster and Nathaniel Wentworth were authorized to serve on a joint committee with the Mayor of Nashua and members of the Nashua public works department. The committee acted promptly; by June a contract was signed with Fred T. Ley and Co. of Springfield, MA. The bridge was 36 feet wide plus a 6 foot raised sidewalk on the north side. Construction proceeded quickly and the first horse drawn vehicle crossed the new bridge on November 17. A few days later on November 23 the first electric car was able to cross into Hudson on the new bridge. Work was soon completed on the bridge except for the need of additional reinforcement of pier #4 which was completed in 1912. The final meeting of the joint committee was held at the Nashua City Hall October 13, 1912. The final payment was made to the construction company. The total cost was $74,480. The only remaining issue was how to apportion this cost between the two communities. The photo of an early trolley on the new concrete bridge into Hudson was taken from the roof of the Old Baker building. This photo is part of our Historical Society collection, complements of Don Himsel. This concrete bridge remained in service until 1971, despite repairs and work on the pilings to prolong it’s usefulness, when it was destroyed to allow for the construction of the present southern span. Just prior to the destruction of the bridge this granite marker was removed and placed on display at the Historical Society. I have not heard or read of any particular dedication of this bridge; nor to I know exactly when the pink granite plaque identifying the names of the individuals on the joint bridge committee. Let’s look at who represented Hudson on this committee. First the three selectmen: Jesse Weston, George N. Dooley, and Guy A. Hopkins. Jesse Weston was born February 1862 in Nashua; moving to Hudson about 1880. He married Agnes Willoughby in Nashua June 1891. While in Hudson he lived on Barretts Hill and worked as a mason. He served as a selectman and Representative to General Court. After the bridge was completed he returned to Nashua where he was employed as a foreman for Osgood Construction Co. and later engaged in the contracting business as Weston and Could. He passed in April 1941 and was buried in Nashua’s Woodlawn Cemetery. George N Dooley was a Hudson native who owned and operated a farm on Old Derry Road previously owned by his father, Stephen. Father and son were active in town affairs. Each served as selectman and in the state legislature. George and his wife Ella (Hadley) Dooley had 4 sons. George N. passed in 1928 at the age of 57 from complications resulting from a farm accident. Guy Hopkins, a bookkeeper, moved to Hudson from Nashua sometime between 1880 and 1909. He lived on the Lowell Road near Wason Road and continued to work as a bookkeeper in Nashua. While in Hudson he served as a selectman and on the joint bridge committee. He returned to Nashua about 1920. Born in December 1843 in MA, Nathaniel Wentworth, enlisted with the 1st Mass Calvary in 1864 at the age of 21 and was discharged about a year later. He married Edwina Greeley in May 1870 and soon thereafter moved to Hudson. He spent most, if not all, of his remaining 53 years living in Hudson Center on Greeley street near the railroad depot. As a young man we was a mason, later he became the fish and game commissioner; a position he held for many years. He was active in town affairs; serving on the committee to build the D.O. Smith School in 1896. Later, after that school was destroyed by fire, he served on the committee to build it’s replacement. the Hudson Center School. In 1910 he was selected to serve on the joint committee between Nashua and Hudson to build the concrete Taylor Falls Bridge. He passed August 1923 and is burried in Westview Cemetery in Hudson Center. Kimball Webster was born in Pelham November 1828; grow up on a farm he was used to hard work. In April 1849 at the age of 20 he left home and traveled to Independence, MO. There he joined a company of 28 men fitted out with pack mules and horses. He traveled over the trail to California in pursuit of the great gold discovery. He worked the mines for a while and then traveled to the territory of Oregon where he began a career as a land surveyor; first with public lands and later as an employee of the railroad. Mr. Webster married Abiah Cutter of Pelham and they settled on a portion of his grandfather’s farm in Hudson. Their adult family consisted of 5 daughters each of whom married and remained in the Hudson/Nashua area. Kimball had an extensive career as a surveyor, civil engineer, Justice of the Peace, writer, and historian. We are reminded daily of the contribution his ‘History of Hudson, NH’ has made to our knowledge of our past. This week we continue with Library Street and look at St John’s Parish House and Elementary School. Two adjacent parcels of land were purchased by the diocese between Connell and School Streets for the elementary school. The first, adjacent to School Street, was purchased from Julia Robinson in July 1955. This parcel was next to the town owned tennis courts on School Street and was what remained of a larger parcel which extended up School Street. The second parcel, adjacent to Connell Street, consisted of land and buildings purchased from Arthur L. Crosscup in August 1956. This had been the home of Phyllis and Arthur Crosscup and their family. Ground breaking for the school occurred on April 28, 1957. While construction was taking place the school actually began classes in the basement of the church under the supervision of Sisters of the Presentation of Mary. For the next year the Men’s Club and members of the parish pitched in every night to assist with the construction. As many as 17 men were there helping 2-3 hours each night to prepare for the opening of the school. In October 1858, after the dedication, the classes were moved into the newly completed school. By 1962 an 8 room addition was built onto the school to accommodate the growing enrollment. The first graduation of a full eight years occurred in 1965. Into the 1970’s enrollment was on the decrease and in 1975 St John Parish announced the school would close as of June 1975. The St. John’s School Board and the School Board of Hudson worked together on a transition. A plan was devised whereby the town would lease the building for one year. After which the town purchased the property and it is now Library Street Elementary School. This school had made a lasting impression on our town. Diagonally across Library Street from the elementary school and adjacent to the church building, the diocese purchased the former home of Charles and Marguerite Farmer in June 1955. By 1962 the home was converted into a convent for the Sisters of Presentation of Mary. It was used for that purpose about 12 years. By 1978 the building re purposed and enlarged as a Parish center. The Parish Center was dedicated May 7, 1978. During it’s nearly 70 years in Hudson, St. John the Evangelist Church, the Parish, and their affiliated organizations continue to serve the Town of Hudson. I think of the Men’s Group (called Holy Name Society), Knights of Columbus an International Organization, Women’s Guild, ,Boy Scout Troop 252, Cub Scouts to name a few. At the present time and in today’s economy perhaps the most notable is St John XXIII Parish Food Pantry. Their service began about 1982 as St Vincent de Paul Food Pantry and has grown to providing food to some 300 different families in Hudson over the course of a year. The pantry is housed in a major portion of The Parish Center at 23 Library Street. One project of note is the ‘Feed Our Kids’ Program where the volunteers of the Food Pantry work with the students of Alvirne High School. This program supplies a backpack with food for eight meals, snacks, and drinks to provide nourishment over the weekend to a number of students. The food pantry provides the food and the students pack the backpacks and deliver them to the students. The food pantry receives support from the entire Hudson Community and their services are available to any family within our town. The photo of the elementary school is from the collection of the Historical Society. The photo of the Parish House is from the records of the Town of Hudson. Prior to the mid 1940’s Hudson had no large industry. As World War II ended cars and gas were more obtainable and travel was easier. Families were moving into the area and finding employment in Nashua or other places, and choosing Hudson as their place of residence. Families with Catholic background traveled to Nashua for their religious connections. Those families of French descent would attend Infant Jesus (Crown Hill) or St. Francis Xavier (French Hill). Those of Irish descent attended St. Patricks; Polish descent to St. Stanislaus; and the Lithuanian families to St. Casimir. By the mid to late 1940’s the Catholic population in Hudson neared 500 families. The Bishop of Manchester, Most Reverend Matthew F. Brady, decided that Hudson could well support and maintain it’s own Roman Catholic Church. In May of 1947 Articles of Agreement were written by Bishop Brady stating that the Diocese would establish a church in Hudson. Thomas J. O’Loughlin and Arthur L. Lougee were selected as trustees. The months which followed were spent planning, selecting a site, and procurement of land. By March 1949 the Diocese owned three contiguous land parcels. Two of these, the former Goddard Home and Connell Home, faced Library Street. The third parcel, formerly site of the town sheds, was to the rear of these parcels and had frontage on Chase Street. This third parcel would become the parking lot for the church. You may be asking, as I have, why this particular location was chosen? It is conveniently located, close to the bridge, and close to Town Services. Beyond that I have no additional insights. As you read this article, you may have some thoughts to share. By March 17, 1949 the first pastor, Rev. John Belluscio, arrived in Hudson and took his residence at St. Patrick’s in Nashua. Within two days of his arrival the Rowell Family of Hudson offered the use of the old Ferryall farmhouse on Webster Street so he could be closer to his parish. Hudson had it’s first rectory! Father John held the first Mass in Hudson on April 3, 1949 in the gymnasium of the H.O. Smith School, then the Hudson Junior High School. Sunday Masses continued at the school until a building was ready for use on Library Street. Work on the new church buildings began the very next day. The Goddard house on what is now 27 Library Street was razed to make room for the new rectory. By mid June the Harry Connell house on what is now 25 Library Street was moved across the street to 30 Library Street on land purchased for that purpose from Raymond Victor Lemery. The Connell house was converted into 4 apartments which were retained by the Diocese as income for the parish. This property was later sold to help with the purchase and building of St. John’s School. In June 1949 Rev. Robert J. Faucher came to Hudson as the first curate to work with Father John and by August the new rectory was ready for occupancy. As the basement of the rectory had an altar; daily masses could now be held. It should be noted that a part of Father John’s task was to create an atmosphere compatible to parishioners of varied backgrounds. Tragically, in August 1950 the associate pastor, Rev Faucher was killed in an auto accident. Rev. Hector Lamontagne was appointed and he would serve 10 years. Construction continued on the church building by Brideau Construction Co of Berlin. The first Christmas Midnight Mass was held in the basement of the new church in 1949. The following Easter morning the first Mass was held in the new sanctuary. The building was dedicated December 3, 1950. In the years which followed improvements were made to the building. By 1987 a 400 pipe Felgemaker Organ (built in 1886) was installed and dedicated. In the 1990’s stained glass windows were added to the sanctuary in addition to the stained glass windows overlooking the sanctuary which was given by St. John’s Women’s Guild. In 1999 St John The Evangelist Parish celebrated 50 years of service in and to the Town of Hudson. The plan of the Diocese was to merge the Infant Jesus Parish in Nashua and the St. John’s Parish in Hudson. In 2007, with the retirement of the priests in each of these parishes, these parishes merged together as Blessed John XXIII Parish (now St. John XXIII Parish) with Monsignor Paul Bouchard serving as Pastor in both. The photos for this week are from the Historical Society Collection. They show the Rectory and St John Evangelist Church as photographed about 1975 in preparation of The Town in Transition. My thanks to Pauline Boisvant, Leona Shanholtz, and Don Smith for helping with he background information for this article. Comments or sharing of information can be by email to HudsonHistorical.com. In 1892 there was but one house on the western side of Sanders Street (now Library Street) between Ferry Street and what is now Central Street. That house belonged to Joseph Fuller. The Hills Memorial Library had not been built and that corner lot was the location of an Ice House. In May 1910 Fred Blodgett transferred a parcel of land containing about 11,975 square feet on the west side of Sanders Street to The Congregational Society. This parcel was part of land previously owned by Joseph Fuller. The very next month the church contracted with Nashua Building Company to construct a parsonage house. Work began July 1 and was completed by October 1 of that same year. This was a major accomplishment for this Hudson Church and their new Pastor, the Reverend Lewis E. Perry formerly from Ayer, Mass. Rev. Perry delivered his first sermon in Hudson in July 1910 and was the first pastor to reside in the new parsonage on Library Street. made and the property was sold as a private dwelling. From 1970 to the present this home has had 4 owners, including the present owner, Mr. Walid Alhgoul, owner of Wally’s Pizza in Hudson Center. The accompanying photo shows 31 Library as of the summer of 2016. The Historical Society does not have a good photo of the early parsonage; ff any of our readers can help locate such a photo; please send an email to Ruth at HudsonHistorical@Live.com. Also, special thanks to David Morin for helping with the research for this article. How many of our readers remember the ice break in the Merrimack River? Not many years after the wooden bridge was built at Taylor Falls, an ice jam and high water pressed so hard against the Hudson pier that there were fears for the safety of the bridge. To avoid this danger in the future this ice break was erected in 1834. Placed in the river on the Hudson side just north of the bridge this ice break has protected three bridges against surging ice flows: the wooden bridge, the iron bridge, and the concrete bridge. It was removed during the construction of the Veterans Memorial Bridge, the northern span of our current twin bridges. Photo from the Historical Society Collection. 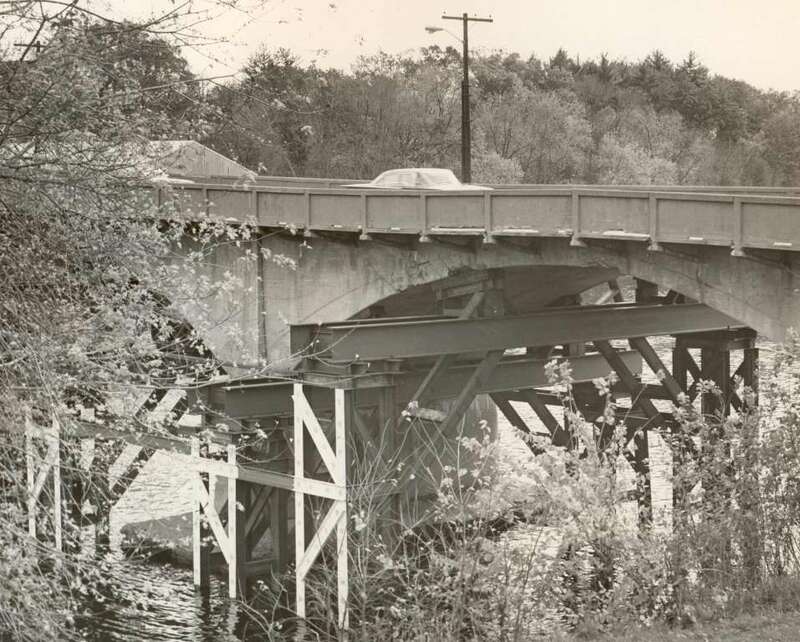 In 1960 the State of New Hampshire commissioned an engineering firm to conduct studies and make recommendations relative to the ever increasing east-west traffic flowing between Hudson and Nashua on the bridge. The resulting Campbell Report, issued in late 1960, stimulated discussion and controversy which required some 7 years to resolve. During that time traffic problems continued. Traffic continued to increase placing more and more stress on the existing, inadequate, and deteriorating concrete bridge. Almost unnoticed the bridge had slowly deteriorated to a point of real danger. Load limits were placed on vehicles crossing the bridge and emergency repairs were planned. While these repairs were underway the bridge was closed to all but pedestrian traffic! Those commuting to/from Nashua would park one vehicle on the Hudson side, walk across the bridge, and continue to their job using a second vehicle on the other side. This week’s photo, taken from the Nashua side of the river, showns the results of the emergancy repairs made to stabilize and shore up the bridge in an effort to prolong its use until the Veterans Memorial Bridge could be completed. Photo by Tom Muller and a part of the Historical Society Collection. As you cross from Nashua into Hudson on the Taylor Falls Replacement Bridge you can see the abutments for this bridge down river on your right. This was the bridge used by the steam railroad as it crossed the river in to Hudson. The original wooden railroad bridge, built about 1874, burned in 1910 after being set afire from a locomotive. It was replaced by this iron bridge which stood until the metal was salvaged in 1944 during World War II. The abutments can also be seen from the shoreline of Merrill Park, located at the end of Maple Avenue. The park entrance is built on a part of the old railroad bed. After crossing the river, the steam railroad continued northeasterly, crossing over Lowell Road and the street railroad on a trestle just south of the junction with Central Street (near Hammond Park). The train continued on to the station at Hudson Center, off Greeley Street and behind Wattannick Hall. It then continued easterly to West Windham. 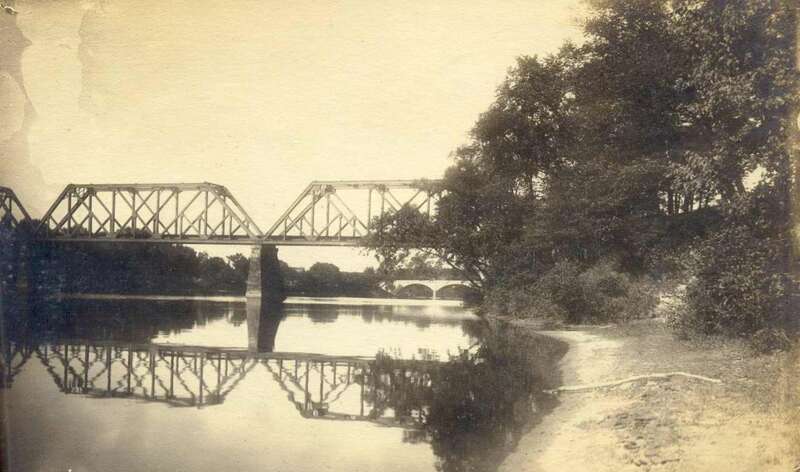 In this C 1910 photo we are looking upriver at the railroad bridge and the newly constructed cement Taylor Falls Bridge which is visible under the bridge. Photo from the Historical Society Collection.